I'm checking out a new tool called the Climate Wizard, which lets you look at temperature and precipitation projections on a state-by-state or nation-by-nation basis under different climate change scenarios. 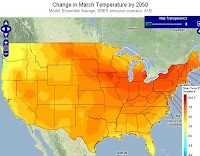 You can look at past and projected climate data and even break down the data by month. It's pretty interesting - and a useful tool too: The Nature Conservancy (which developed the Wizard with the University of Washington and the University of Southern Mississippi) is using it to help predict how plants from around the world will behave in other locations: “I can look at the home temperatures of these aquatic plants to see if the climate ranges overlap with Florida and use that as one predictor of whether they might become invasive and cause problems in our habitats," noted Doria Gordon, TNC's director of conservation science. The tool has also found that if emissions continue to rise unchecked over the next 100 years, Kansas, Nebraska and Iowa would heat up the most, followed by South Dakota, Oklahoma, Missouri and Illinois.